Jim McElwain, left, was hired at Florida and Mike Riley, right, at Nebraska. 1. As of Friday, 11 FBS schools will have new coaches in 2015. Which of the jobs is most appealing? ♦ Kansas! Sorry, JK! Despite my roots at the U, I'll go wtih Florida for the same reasons why any job in the state is a great job -- talent. You also have a school that is willing to spend whatever it takes to get back on top of the college football landscape. It's not easy there, but Jim McElwain is a smart hire since he's been in this role before (unlike Will Muschamp) and has ties to the SEC recruiting hot-bed. When you're the head coach in Canesville ... err, I mean Gainesville, you have the pick of the litter. It's just a matter of evaluating and finding the right fit. Appealing? Heck yeah. He got off the plane on Friday in a blazer with no socks on! Palm trees and sunshine! ♦ You could make arguments against each school, but I’d lean toward Nebraska. Of the three major football programs that had openings (Nebraska, Florida, Michigan), Nebraska has the highest upside. The Florida and Michigan jobs will require serious battling to regain recruiting lines fractured from those schools’ previous coaches. Nebraska, not so much. Although you could say playing at Nebraska no longer has the sheen it once did, it still has luster. And Mike Riley, Nebraska’s new coach, will be welcomed by a solid pool of talent that won’t be available at those other programs. Plus, Nebraska fans are starving for a return to the glory days. ♦ Colorado State -- the fresh air, fair-to-middling cost of living, not a lot of traffic in Fort Collins, recruiting against a downtrodden in-state rival, new stadium project ... what's not to love? Jim McElwain didn't leave the cupboard bare; the Rams' base is solid -- only 15 seniors on the roster -- and there is opportunity for success. It's not Nebraska, Michigan or Florida -- but when was the last time any of those fan bases were satisfied. (If you didn't notice, ol' Rich Rod is doing OK in Arizona. And as for Huskers and Gators fans ... well, this ain't your daddy's -- or granddaddy's -- Huskers or Gators.) Colorado State will continue to succeed, and that's all you can ask. Doug Kroll: Did you see McElwain's house this week when Jeremy Foley stopped by to court him?! That right there is a great reason. But how do they shed it as a “stepping stone” job? Duane Cross: There are only a few “destination” jobs, so being a “stepping stone” job is what the vast majority of programs are in college football. And if you're an up-and-coming coach, there are worse places than Colorado State to be a step away from a perceived elite Power Five school. Doug Kroll: No doubt about it, and it's why Colorado State put in the insane buyout on McElwain's contract -- they knew this day would come. But any big-time program will pay whatever price for a great coach. And that's what Florida did. Brendan Bures: I agree. And Jim McElwain has shown that genuine success can be found at Colorado State. If you're a coach looking for his first shot, I think Colorado State is a fine choice. But in terms of most appealing, any coach would like end up at a “destination” program. And, that big buyout will help Colorado State attract the pick of whatever litter they choose from. Colorado State will be fine following McElwain's departure. Duane Cross: McElwain spent four years at Alabama as the offensive coordinator / QB coach so that will help him -- but more than anything, his three years at Colorado State set up him for the Florida gig. You've gotta prove you can run a program (win) before the destination jobs come calling. There aren't a lot of coaches ready for those gigs, so why not hone yourself, and your résumé, at a place like Colorado State? There'll be a lot less pressure than those folks stepping in at UF, UM and Nebraska. Doug Kroll: Definitely. There's certainly not a wrong answer to this question, it just depends on what stage you're at in your coaching career. Muschamp went 28-21 in four years at Florida. Brendan Bures: But Doug touched on something there: the talent in Florida. More quality recruits exist in the state, of that there's no doubt, but everyone knows that now. It's not like the 1980s and ’90s, when mostly Florida and SEC schools were recruiting those kids. And Jimbo Fisher has built Florida State into a program that kids want to join, and UCF's not a bad choice to get a legitimate shot as a mid-tier talent, and the U will always be the U. I think McElwain has the credentials to turn around Florida, but it's not an “appealing” place at this point. It’s too much of an up-mountain battle. Doug Kroll: I agree with that to an extent, but every coach has an ego. And every coach thinks he can be the one to do it. Duane Cross: Any word on whether McElwain's deal includes a stipend for jorts? Brendan Bures: Every person playing or coaching at Florida receives a complimentary pair of jorts so they feel included. 2. Which conference championship game are you most intrigued by this weekend? 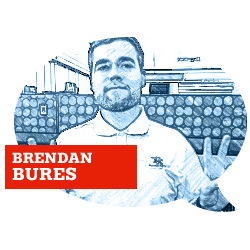 Brendan Bures: I’m going away from what’s expected of me here and saying Arizona and Oregon. As much as fans might watch Florida State-Georgia Tech with bloodthirsty eyes, Arizona-Oregon is equally intriguing, if not more so. The Ducks’ only loss has been against the Wildcats and that was with home-field advantage. Every team is on its last life now, and any loss will knock out a team. Oregon is susceptible to a loss at Arizona’s hands because of its front seven, led by Scooby Wright. (Quick side note: Great linebacker, not a Heisman candidate. Glad we have that cleared up.) If any team is liable to lose its spot in the CFP at this point, Oregon’s as good as any. Doug Kroll: ACC! ACC! Every Florida State game has been must-see TV, so there's no doubt Saturday's tilt in Charlotte against a sneaky-good Georgia Tech team won't be any different, right? There's actually a really interesting angle to this, and it has to do with the option offense GT runs. Remember earlier this season when FSU played The Citadel, which runs the same type of offense as GT, and the Seminoles said they didn't like playing teams that cut block (and who does -- I'm not making fun of them for once)? We'll see how they approach a much better cut blocking team than The Citadel. Duane Cross: Aside from the absolute obnoxiousness of some Georgia Tech fans (c'mon, at least act like you've had success), it'd be interesting to see how college football fans would react to Florida State losing while on the cusp of being able to defend its title. Brendan Bures: With absolute glee, Duane! Florida State is the “villain” of college football now, a role the team has embraced. Nothing makes fans happier than watching villains fail. Doug Kroll: The SEC game does nothing for me. And I'm sorry to be one of ‘those guys,' but it's hard for me to get up for this one and think a team that has a loss at home to Indiana can beat the Tide on a neutral field. And I know A has nothing to do with B, but man it just doesn't get my juices flowing. Brendan Bures: Plus, we saw how Alabama fans traveled to Atlanta when UA took on West Virginia at the beginning of the season. The SEC championship game is about as un-neutral as a "neutral" site game can be. Not sure how anyone expects a different result than the inevitability of the Crimson Tide death march. Duane Cross: Boise -- against a .500 Fresno State team? Oh, Gus Johnson, where art thou -- because he would make that game worth watching. Brendan Bures: What if everyone loses? Oregon, Florida State, Alabama, TCU, Baylor, Ohio State? Now, that would be chaos. 3. Who do you expect to be in the playoff after this weekend? Will TCU stay ahead of Baylor? 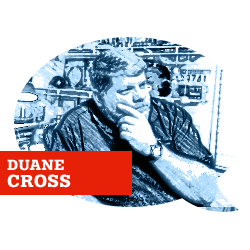 Duane Cross: 1. Alabama 2. Oregon 3. TCU 4. Baylor -- that's right, two Big 12 teams make the field. And yes, I have Baylor leap-frogging Ohio State; the Bears win the Big 12 by beating K-State and that propels BU into the dance after Georgia Tech wrecks Florida State. Brendan Bures: ... And as “fun” as that may be, I don't think much will change following this week: 1. Alabama 2. Oregon 3. Florida State 4. TCU/Baylor. I still can be convinced either way that TCU or Baylor deserve the spot over one another. Duane Cross: If Baylor KOs K-State -- a top-10 CFP team -- while TCU beats 2-9 Iowa State ... I think "what have you done lately" takes on a larger meaning. 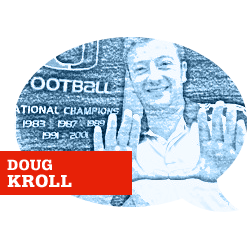 Doug Kroll: FSU, Oregon, TCU, Alabama in no particular order. No change from this week. There's no reason to think FSU is going to lose until they actually do. And Oregon will right the ship against Arizona. The other two -- no contests. Brendan Bures: Ohio State will not make the playoffs regardless due to an injured J.T. Barrett. The College Football Playoff committee doubles as TV execs. How else to explain the week-to-week shenanigans and making-it-up-as-we-go philosophy? There, I said it. Doug Kroll: As far as Oregon goes ... it's so hard to beat a great team just once, so to ask Rich Rod to do it twice in the same season? I just don't see it happening. Not to mention how much better the Ducks are now compared to then. Duane Cross: Agree, Doug -- the best-case scenario is Alabama-Oregon being 1-2 on Sunday, setting up the possibility of those teams playing for the national title. A month for either team to game plan against the other ... dang, folks would be tweeting their fingers to a nub. Doug Kroll: We could spend hours on the Baylor vs. TCU argument, let's just have them play it out on the fie-- ... oh wait. I hate the 'what have you done for me lately' argument when A) they played one another and B) they played each other to basically a high-scoring draw. Look towards non-conference opponents? TCU wins that battle ... easily. Brendan Bures: Special shout out to 7-5 Maryland! Brendan Bures: So, interesting subplot to this question as Duane's hinting it: Should it be TCU or Baylor, assuming both teams win? If you say TCU, you're of the camp who believes it should be the four best teams in the CFP. That (mostly) comprises of eye-test and general hype. But if you say Baylor, you believe resume and head-to-head results matter more than the rest. Baylor vs. TCU is just a giant philosophy argument, really. Duane Cross: Philosophically speaking, Brendan, you just want to stir the pot.